If you want that magic mirror to tell you that you're the fairest maiden in all the land, you're going to have bring your "A" game in terms of what you're wearing. Because trust us, that pesky mirror will let you know if you don't quite look the part. Is your dress historically authentic-looking? Is it rich in detail? Could it pass for the wardrobe of a young country maiden, or a noble lady of wealth and means? That's a lot of bases to cover, but this dress will help you pull it off... and finally, at long last, silence that mouthy magic mirror! 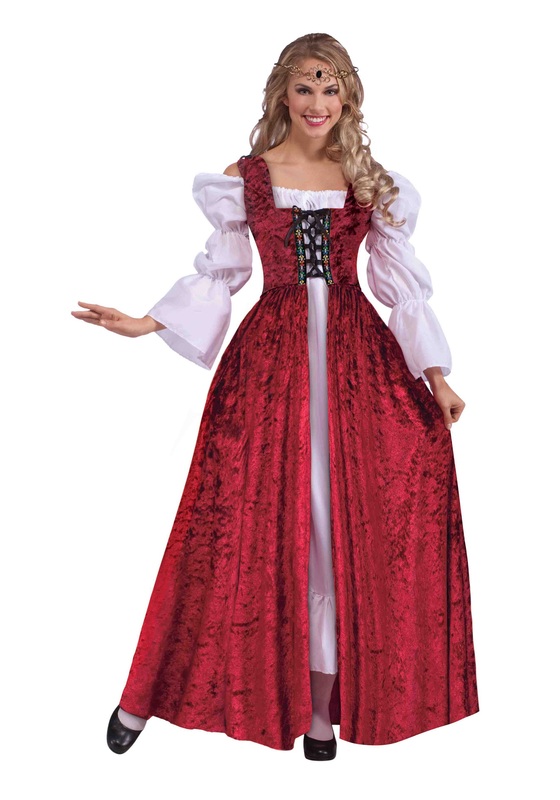 For a great way to get into character and leave an impression no matter what time period you're in, there's no better option than this Plus Size Women's Medieval Laced Gown! Made of crushed velvet for a truly lustrous and historical look, this dress looks great worn over a petticoat, chemise, or underskirt. It's open at the front so you can have that classic "layered" look, which in Elizabethan times (and many others, for that matter!) was truly all the rage. Another detail that hits perfectly on fashion from 16th Century Europe is the bodice with the laced front, which evokes a time when clothing wasn't churned out by assembly lines and had to be hand-made. It's the perfect attire for any medieval-themed Halloween party, stage production, or, of course, renaissance fair. Just be sure to have a look around at our wide selection of wigs and jewelry for the perfect historical accessories! Apparently you have to buy the chemise underneath the gown. The gown is already expensive enough without having to purchase something else.